GOLD AND BLACK ILLUSTRATED VOLUME 28, ISSUE 6 23 most part, I think a lot of guys are extremely hungry. There are a lot of expectations for the offense in Year 2, especially because we know the playbook at this point like the back of our hands. "I think a lot of people are really looking forward to stepping up." Players understand the offensive concepts and their roles in them better now than a year ago, and Brohm, too, knows his personnel better and that should allow him to maneuver defenses even more. He wouldn't say how close he is roster-wise to be- ing able to run his ideal offense, probably because he doesn't want to be pigeon-holed. But Brohm does admit to going too conservative in the middle of last season and thinks this group is better-served to play more wide open. 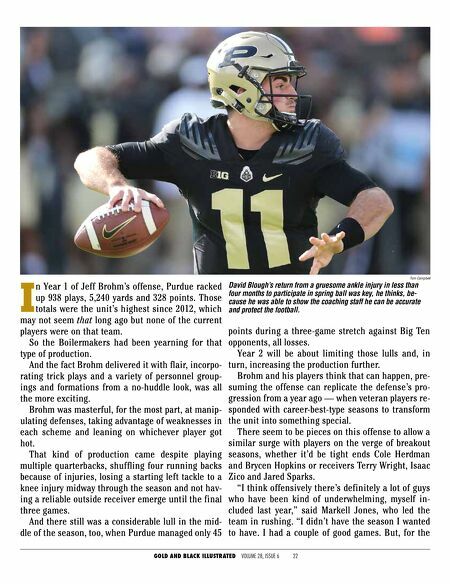 "That doesn't necessarily mean we have to throw it every play," Brohm said, "but we'd like to try to get more explosive plays up the field, which we got a lit- tle better at toward the end (of last season). Running the ball is going to be important to a certain degree and having explosive plays off the run to go with it." The running backs should be the strength, return- ing the top four rushers from a season ago. There are two quarterbacks on the roster who have started games, and both have produced in them, too. The top three tight ends have game experience and offer a variety of skills, able to be weapons in the passing game but also hold up in the run game. The offensive line has more depth, though Brohm wants the unit to be better in pass protection after allowing 33 sacks a year ago. Tom Campbell For the third consecutive season, Markell Jones led Purdue in rush- ing in 2017. As a senior, he's hoping to finish with a flourish.